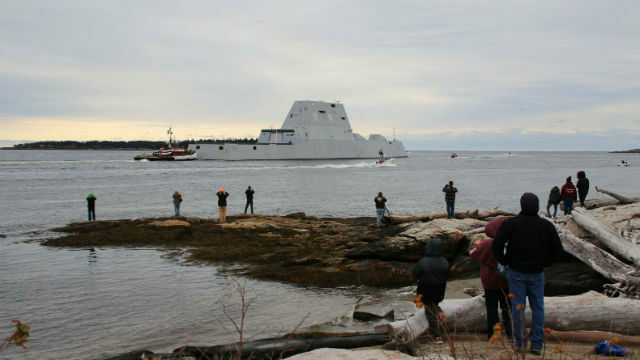 The Navy’s second futuristic Zumwalt-class guided-missile destroyer has left a shipyard in Maine on its way to San Diego for commissioning in January. The 16,000-ton Michael Monsoor left Bath Iron Works and sailed down the Kennebec River on Friday and out to the Atlantic Ocean. Its commissioning is set for Jan. 26 at Naval Base Coronado. The ship is named for a Navy SEAL and Long Beach native who died in Ramadi, Iraq, in 2006. The Monsoor’s departure was delayed when one of its two gas turbine engines was damaged during trials in April and had to be replaced. Zumwalt-class destroyers are armed with 80 missiles in vertical-launch tubes and two 155-caliber long-range guns. The USS Zumwalt, the first in the class, is already in San Diego. The third ship in the class, the future USS Lyndon B. Johnson, is set to be delivered to 2020.